This exceptional bluebird house has plenty of features that you and your feathered friends will love and appreciate. 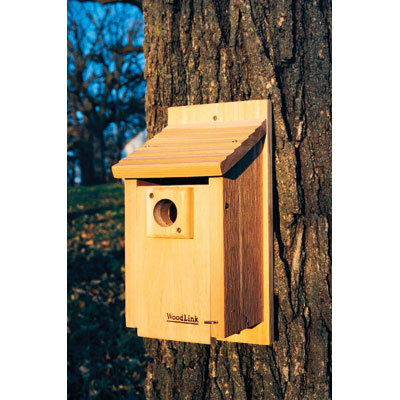 From a sloping roof and drainage gap to keep nests dry, to ventilation slots and a predator guard for optimum comfort and safety, the Woodlink Traditional Bluebird House is a welcome addition to the fight against bluebird habitat loss due to residential and commercial overdevelopment. Hole Size: 1 9/16 in. Depth: 6.00 in. / 15.2 cm. Width: 6.5 in. / 16.5 cm. Height: 14.00 in. / 35.6 cm . Weight: 3.75 lbs. / 1.70 kg.